The WILDCHILD - American Workspace Inc. In 1965, Ford of Canada built only seven special Falcons equipped with a 289 CI - 271 HP "Mustang HiPo" motor. Of these seven, three were produced as B/FX (factory experimental) racecars using many special non-production performance parts. 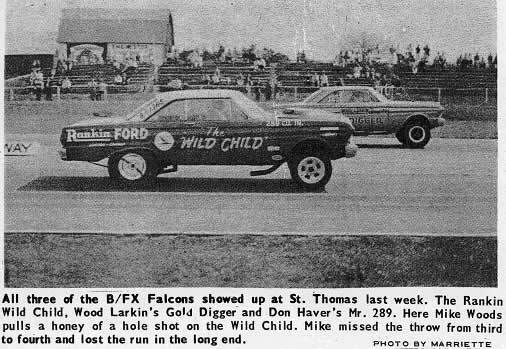 Rankin Ford's Wild Child, Wood Larkin's Gold Digger, and Don Haver's Mr. 289 were the only Factory Experimental Falcons that were actually built . The most successful of these B/FX racers was the "The Wild Child" as it was also the only factory B/FX Falcon further developed and raced as a 427 cubic inch fuel-burning B/A, a C/XS Funny Car, and finally in 1967 as an A/FX with a 427 SOHC motor. The Wild Child is also the only one of these three Factory Experimental cars known to still exist today. 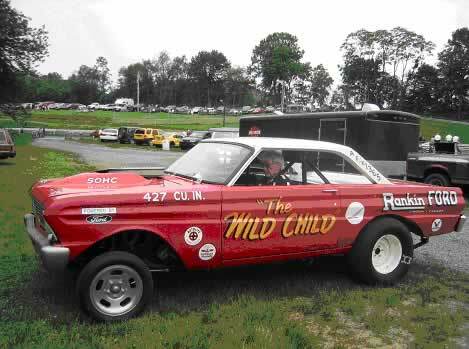 With an engine and transmission build code of 992, the Rankin Ford Wild Child Falcon was special-built in late April 1965 with the 289 cubic inch high-performance motor, a NASCAR-style top-loader four-speed transmission, and a 9-inch Detroit Locker rear end with 4:57 gears. Also built with a special body code of 99, the Wild Child had fiberglass body panels supplied by Plaza Fiberglass of Canada. 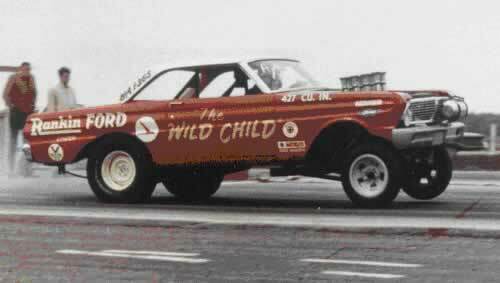 With all of its non-production modifications, the National Hot Rod Association (NHRA) placed the Wild Child in the B/Factory Experimental (B/FX) racing class in 1965. Ford of Canada delivered this special car to Rankin Ford in early May 1965. As soon as Rankin received delivery of the B F/X car, the motor was immediately removed for further race enhancements including the installation of Ford Cobra heads, Cobra/Weber intake and carburetors, an Isky cam, Salih pistons, and a set of custom built exhaust headers. John McIntyre (L) and Ev Rowse at Rankin Ford when the Wild Child was new. Based in London, Ontario, Rankin Ford was Canada's top drag racing dealership. They developed and raced the Wild Child for the sole purpose of winning top-level drag racing championships on Canadian soil. Over the Wild Childs' great three-year racing career, John McIntyre and Ev Rowse led the race effort for Rankin, winning many a race in both Canada and the US. 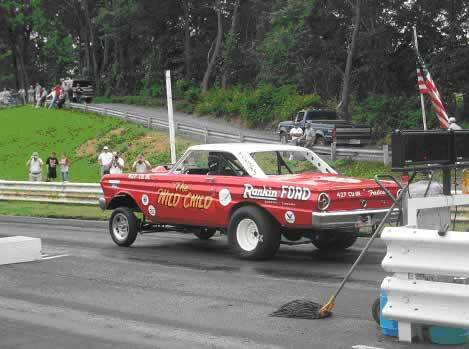 Rankin Ford ran the Wild Child in the 1965 season in the NHRA B/FX class with John working the mechanics and Ev doing most of the driving. John would also drive the car on occasion that year. 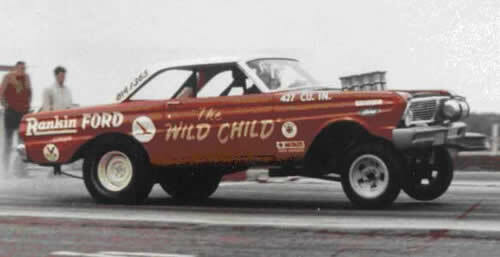 The Wild Child was a popular winning entry at Cayuga, Grand Bend, Mohawk, and St. Thomas drag strips in Canada, and also in the United States at Detroit, Milan, and Niagara drag strips. The Wild Child had a fantastic year in 1965, beating nearly every opponent including some famous match-races of the day. 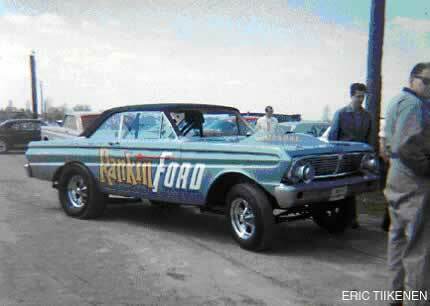 According to Ford/Mercury Performance News on September 28, 1965, "At St. Thomas Dragway, St. Thomas, Ontario on Sunday, September 26TH Ev Rowse, driving the Rankin Ford Falcon B/FX today went through a strong field of B/FX cars to take the trophy with an 11.76 and 118.95. Ev then proceeded to wade through a number of cars for the Street Eliminator, finally ending up against the Argyle Chrysler's 1965 Dodge hemi-head SS/A Automatic. Ev charged to the win with an 11.58 and 119.75, the lowest ET and highest speed so far attained by a Canadian B/FX car." After the end of that fantastic season, Rankin Ford decided to upgrade the Wild Child to compete in the same A/FX class as the Phil Bonner "Daddy Warbucks" and the Hubert Platt "Georgia Shaker" cars did in the States. During the winter of 1965-66, Rankin took the next radical step in the Wild Childs' racing career. The rear wheels were pushed forward eight inches, and a straight-axle front end was installed, stretching out ten inches towards the front. Rankin then obtained a new 427 Hi-Rise wedge motor with Hilborn fuel injection for the 1966 season. According to John, the engine arrived at the shop mistakenly set up for fuel, instead of gas. Since the motor was run with Alcohol and Nitro in 1966, rather than gas as required in the A/FX class, the NHRA assigned the Wild Child to the B/Altered (B/A) class. As one of Canada's first funny cars, it also raced in the C/XS class. The radical switch from gas to a fuel based car proved to be problematic for the Rankin Ford team. While the Wild Child was still winning a lot of races, engine reliability problems put a damper on the 1966 season. This is one of my favorite Wild Child shot taken in 1966. Ev's got the left front tire off the ground. At the end of the 1966 season Rankin decided to get into the A/FX class full time, and a new Ford 427 Single Over Head Cam (SOHC) race motor with dual carburetors was obtained from Ford's contract race shop, Holman-Moody of North Carolina. John and Ev were committed to bringing the Wild Child to yet another level of performance with Ford's hottest race motor, the 427 SOHC. Looking to stabilize its engine reliability, the 427 SOHC motor was machined to use wider and stronger Chrysler Hemi connecting rods. The engine was also fitted with the new Crane Nitro cams, developed specifically for the SOHC motor. The motor produced a huge amount of horsepower and it was also more reliable using gas instead of fuel. 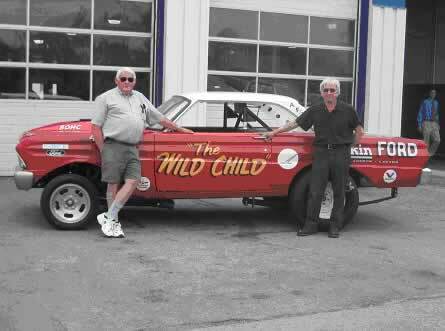 In 1967, the A/FX Wild Child, with Ev behind the wheel, consistently won races in both Canada and the United States. It was the Canadian record holder in the A F/X class. 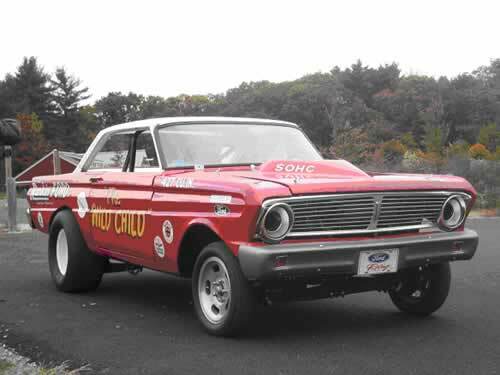 The SOHC motor was bulletproof and 1967 turned out to be a very good race year for Rankin Ford and the Wild Child. During this time, the car was painted a new Ford blue color and no longer bore the Wild Child name. However, it was still known throughout the race circuit as the Wild Child. 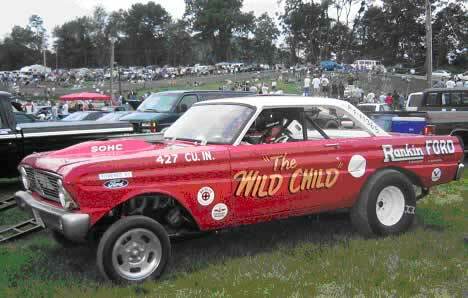 In 1967 the A/FX Wild Child with the 427 SOHC is just called "Rankin Ford". At the end of the 1967 season, Rankin Ford sold the Wild Child to a gentleman who repainted the car gold metalflake paint, and named it "the Golden Boy". The Wild Child's serious racing days were over and there were only infrequent sightings of the car over the next 25 years. In 1992, the car was sold to a London, Ontario Lincoln-Mercury dealer who painted the car white, renamed it the Wild Child, and used the car mostly for display. The car was resold again in 1995 to a private individual in St. Thomas, Ontario and was garaged until I purchased it in May of 2003. All together and on its way to MA with a stop at a friends house in NY. When my brother-in-law Bob Dover and myself brought the car down from Canada, it was obvious that the Wild Child had suffered many years of neglect, yet it appeared to be all in tact, including the ultra-rare Holman-Moody SOHC motor and the trick C6 transmission that Rankin Ford built. 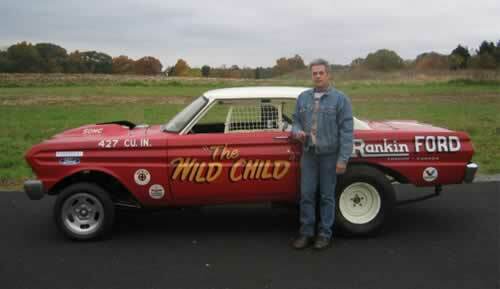 The Wild Child in 2003 with the 427 SOHC motor still in tact. We changed the engine oil and after a bit of coaxing, the SOHC motor fired up. The walls of my garage were shaking from the sheer power of the car. After about 30 ground-pounding seconds, we shut it down knowing that our next step was to completely dismantle the car for a full frame-up restoration. With some leads and a few old phone numbers, I set out to discover the Wild Childs complete history. I contacted Bob Rankin, who's father owned Rankin Ford, Ev Rowse, the driver and John McIntyre, the mechanic on the car for Rankin Ford. From the early conversations all the way through completion of the restoration project, the extensive documented history, in both print and countless conversations, has been invaluable. Ev and John were especially useful in helping me understand why and how they did something on the car, and made the restoration project extremely interactive with the initial developers and racers of the car. In October of 2003 we began a very hard nine-month restoration project, driven by a commitment to bring the car to the June 2004 All-Ford Nationals in Carlisle, PA where I was invited to display and race the Wild Child. It was there that Ev and John would see the Wild Child for the first time in 37 years. It had to be done on time and correctly. To fix the many war wounds from years of quarter-mile pounding, the restoration began by completely dismantling the car and updating the chassis. 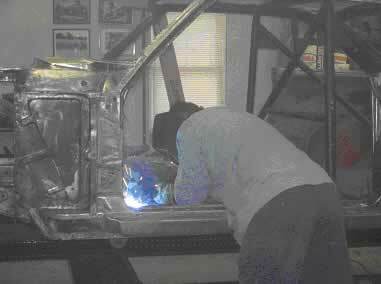 The roll bar was reinforced to bring the car up to current NHRA standards as well as other subtle, but important, safety upgrades. The chassis is stripped, being repaired, and getting some reinforcements. While the chassis and body were being restored in our Motorhead Extraordinaire shop, Jay Robarge, of Broader Performance in Dracut, MA rebuilt the C6 transmission and also built us a new high-stall torque converter. When Jay dismantled the transmission, he discovered some really special Ford parts being used inside. John McIntyre confirmed that they were using special C6 valve bodies from Ford's Powertrain Group and that Ev had also added a few trick modifications of his own. Phil Miller and Mark Savoie of Miller Machine in Haverhill, MA rebuilt the 427 SOHC engine for us. Miller Machine is the same shop that built many of the Tasca Ford SOHC motors back in the ‘60s. What was simply amazing to me was that Phil Miller still had brand new SOHC intake valves sitting on his shelves. We did have some trouble with one of the original Crane Nitro cams during the rebuild. Fortunately Crane located an un-ground SOHC cam blank, and ground it to the original Nitro 600 specifications. 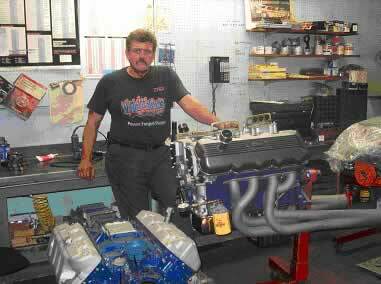 Mark Savoie from Miller Machine in front of the SOHC motor and his Boss 429. Because the motor utilizes the wider journal Chrysler rods, the pistons were even more unique than regular 427 SOHC pistons, if they are not rare enough on their own. Venolia came up with a set of forged SOHC pistons, to meet Phil Miller's specifications that had the wrist pin repositioned. This allowed the pistons to work with the Chrysler rods that had a different journal size and rod length than stock Ford 427's. Instead of going with aluminum race-only rods like Rankin did, we opted for a set of Eagle H-beam steel rods. 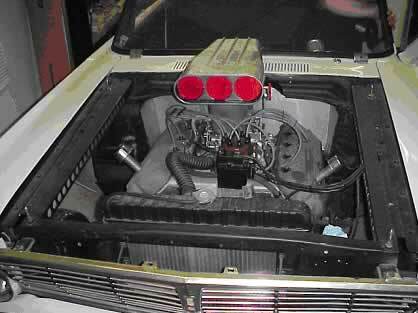 We also installed a MSD ignition, in large part so we could rev-limit the motor in the 7500-RPM range, a more conservative number than the 8,500 to 9,500 RPM limits used back in 1967. Our intentions were to run the car reliably in nostalgia events, not to set records again. Therefore, we went for a more conservative approach, as if one could ever consider a SOHC powered A/FX car conservative. We completed the remaining restoration work in our Motorhead Extraordinaire shop, including all of the bodywork, painting, and restoration of all other components. The rear wheels, custom made by StocktonWheel to the original Rankin specifications, are shod with M&H 10.50 x 30" stickies. The original front wheels used in 1965-66 were made by WellsFoundryof London, Ontario and were impossible to locate. The closest we found were a set of vintage Ansen wheels that were mounted up with a set of M&H front-runners. We still have the original Keystone mag wheels and race slicks that Rankin ran in 1967, and they look in surprisingly good shape. But as we know, 40-year old tires are not very trustworthy. The body is painted and awaiting sanding, buffing, and final assembly. 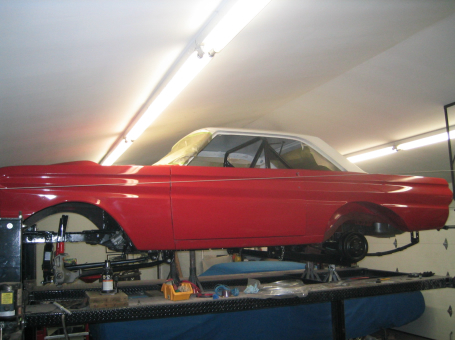 A "complete package" restoration was the focal point of our efforts. To that end, we have obtained an identical 1965 Ford F100 pickup that Rankin Ford used to tow the Wild Child in 1965-66. I remember calling my brother-in-law, Bob, on an early Sunday morning telling him that I had found the identical truck in Indiana. 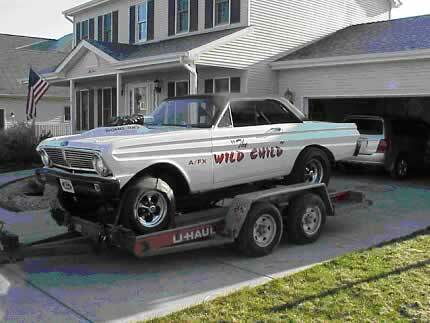 Bob, wanting an old truck for some years, actually purchased the truck for towing the Wild Child. We ordered a custom-built trailer from Specialized Trailers in Weare, NH for the car. Mike McIntyre (no relationship to John) really went all out for us in building a trailer that not only looked like the original one but was also fitted with all of the modern high quality features, including brakes, lights, and torsion suspension. The trailer even has 14-inch wheels so that we could use Mustang hubcaps just like Rankin did back in 1965. 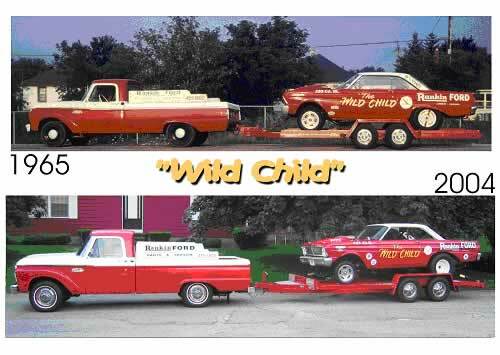 Today, the truck, trailer, and Wild Child are nearly identical to pictures taken in that year. I love this "Then and Now" picture. It is all basically identical to what Rankin ran in 1966. With the tireless assistance of Bob Dover and my good friend, Chuck Katsikas of CK Shop in Santa Fe, NM, we finished the car just in time for the June 4th All-Ford Nationals in Carlisle, PA. For the first time since 1967, both Ev and John were once again reunited with the Wild Child. I'll never forget the look on their faces on that Friday morning in Carlisle when we unveiled the Wild Child amongst a sea of 1964 Thunderbolts to resounding applause by the crowd. Ev and John were extremely pleased with the exacting detail in the restoration and have fully confirmed the cars authenticity. On that special Friday evening in Pennsylvania, the Wild Child made it's first run since 1967 at South Mountain Dragway. Seeing Ev and John racing again with the Wild Child was the ultimate culmination of our hard work. Ev getting ready to take his first Wild Child run in 37 years. Nervous? This is it! Ev's first run in the Wild Child at South Mountain Dragway. That's me getting ready for my first run after Ev's. Am I nervous? Yea, in a good way. 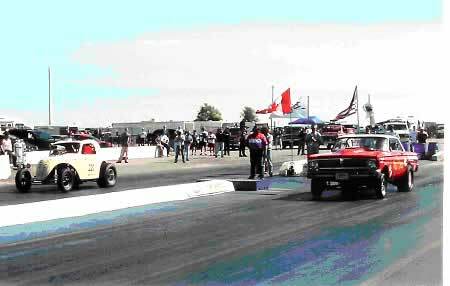 In June 2004 we took the Wild Child back to Canada for a 50th reunion celebration at Cayuga Dragway (now called Toronto Motorsports Park). Ev Rowse once again drove the car and even went heads-up with an Altered Fiat that he had raced against back in 1966. 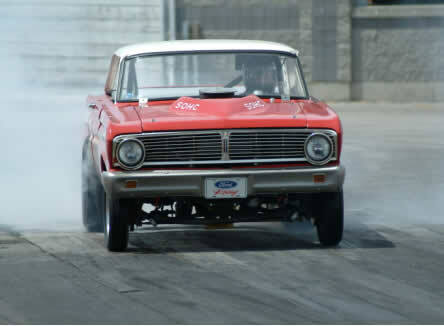 We also raced the car at Grand Bend Dragway that weekend. All weekend long John and Ev helped us get the car in race order. It's amazing how much they still remembered as they jumped right into setting the car up. Bob Rankin came by Ev's shop to look things over. He was extremely pleased with our work and he also confirmed the cars authenticity. Cayuga in 2004 is their rematch race of 1966. Great burnout at Grand Bend in June of 2004. The restoration of the Wild Child could never had been done without the support, guidance, and inspiration of Ev Rowse and John McIntyre and everyone else along the way. I especially want to thank Bob Dover who was my right hand man throughout the entire project and who also owns the beautiful 1965 F-100 truck. 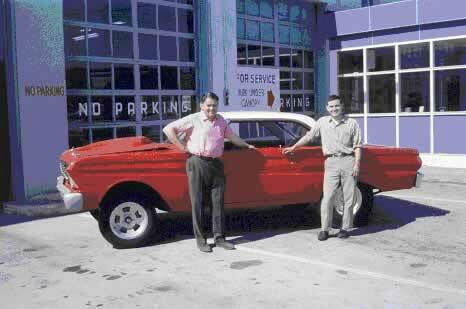 John McIntyre and Ev Rowse in front of the old Rankin Ford. The folks at Highbury Ford treated us real nice when we visited them in June 2004. 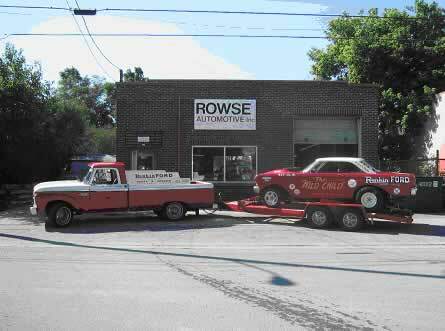 We are parked in front of Ev Rowse's repair shop in Canada. 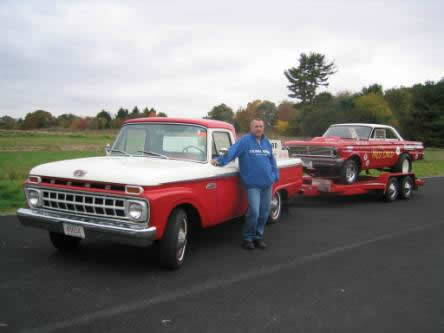 Bob Dover in front of his F-100 Truck and the Wild Child. The Wild Child is owned by Joe Germann and his wife Kinty and sponsored by Motorhead Extraordinaire. American Workspace is a Massachusetts-based company, owned and operated by Joe and Isabelle Germann that specializes in Professional Storage and Workspace Solutions for manufacturing, repair & maintenance, motorsports, and home shops. The Wild Child is currently on Exhibit at the Owls Head Transportation Museum in Owls Head, Maine. We often have Free Passes available. You would really love this place.